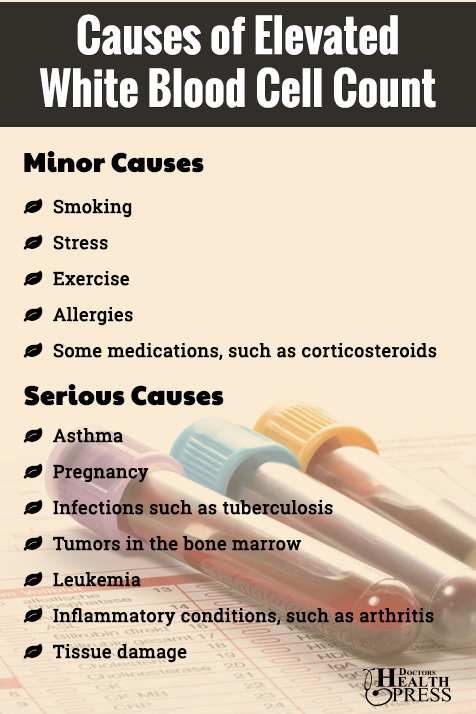 Home » General Health » What Causes Elevated White Blood Cell Count? You may be reading an article similar to this one and come across a medical condition that gives you pause. You may not know what it actually means for your health. For example, we’ve done a few articles recently that mention elevated white blood cell count. But what are the implications of an elevated white blood cell count? Is it good or bad for your health? In this article, we’ll discuss what happens when you have too many white blood cells, what food can help lower your count, and how you should prepare for a white blood cell count test. Elevated White Blood Cell Count: What is the Normal WBC Count? Before you can figure out what an elevated white blood cell count is, you need to know what a normal white blood cell count. The scale for a normal white blood cell count changes from birth to adolescence. As an infant, your white blood cell count tends to be higher, and the count steadily decreases to the age of 16. The measurements are taken per microliter or mcL. “Normal” white blood cell counts can vary from laboratory to laboratory, but they do tend to be similar. The following information is what the Mayo Clinic considers normal white blood cell levels. If these are the normal white blood cell count, then anything above them would be considered elevated. But what are the causes of elevated blood cell levels and what do they mean in terms of your health? An elevated white blood cell count is called leukocytosis and can be evidence that your body is trying to fight off something. If your test results show an elevated white blood cell count, your first thought might be that something horrible is wrong with you. 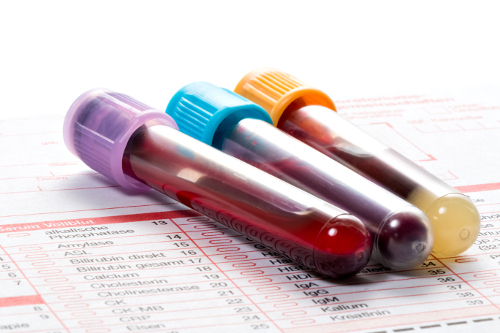 While many of the causes of an elevated white blood cell count are serious, there are also less worrisome reasons such as external issues that affect the test or lifestyle factors that can easily be altered or avoided. The above complications pretty easily explain the elevated white blood cell count. If they do elevate the white blood cell count, they can quickly be accounted for or stopped in time for the next round of tests. However, the more serious conditions that can cause elevated white blood cell count are nothing to take lightly and would have to be looked at very carefully. While some of these conditions tend to come with other obvious symptoms (tuberculosis will usually come with a cough, pregnant women may have morning sickness),with other causes like leukemia and bone marrow tumors, the elevated white blood cell levels may be one of the first warning signs. You can go in for further tests. But if the cause of your slightly elevated white blood cell count isn’t incredibly serious, does it affect your body and its various systems? Your doctors have determined that, for some reason, you have an elevated white blood cell count. We know it may indicate an underlying condition in your body, but what does that actually mean for your physical health? What can the elevated white blood cells do on their own? People who are suffering from elevated white blood cells may also end up suffering from symptoms like fever, fainting, bruising, weight loss, general pain, and even, in some extreme cases, bleeding. This is due to the white blood cells’ function in the body. If the white blood cells are busy attacking a virus or infection, they may be so focused on the big fight that they miss out on other issues that come up at the same time. With this being said, is there anything you can do to get your white blood cells back down to normal levels? Is there a diet or certain foods that can help bring your white blood cells levels back down? Can Food Help Lower Elevated White Blood Cells Count? There are a number of foods that can help you lower your white blood cell count naturally. The following foods can not only help you lower the white blood cell count, but they are also good, healthy choices alone. Foods high in antioxidants like carrots, blueberries, onions and garlic are great to help with the immune system. Vitamin C-rich foods like pineapple, oranges, and red peppers are great for helping to boost the immune system as the vitamin is needed for the proper function of white blood cells. Vitamin C also helps tissue repair itself, which can help relieve the white blood cells of some of their workload. Note, this does not mean you should stop taking these prescriptions unless your doctor gives you specific instructions to do so. Since white blood cells help fight disease, viruses, and infections, you may assume that an elevated white blood cell count is a good thing. Sadly, this isn’t the case as it means that your white blood cells are engaging in a battle that you may be unaware of and the body feels seriously threatened. While it’s not as worrisome as a low white blood cell count, an elevated white blood cell count should be monitored just to make sure it’s not due to a serious underlying problem.